There is a neat inversion of yesterday's theme of modern orchestras being influenced by baroque performance practices in the double CD above. About Baroque features the unusual combination of contemporary music and period instruments. It was the product of an innovative funding initiative by the Siemens Arts Program that brought together the Freiburg Baroque Orchestra and five leading young composers in a series of workshops and rehearsals that allowed the composers to understand the sonic potential of period instruments. The output from the programme was five new works from Michel van der Aa, Juliane Klein, Rebecca Saunders, Benjamin Schweitzer and Nadir Vassena written specifically for the Freiburg Baroque Orchestra. These were captured in concert performances and released on About Baroque in 2006. Let's make one thing clear, About Baroque is not ersatz early music. It is very contemporary music written for a leading period instrument ensemble. And how well it works. Those very qualities, a lighter but more textured and focussed sound, which Antoine Leboyer fears are undermining the classical and romantic repertoire, open up infinite new possibilities in contemporary music. The combination of new music and old instruments is so successful that I was about to wonder why it hasn't been done before. But it has, and here are just two examples from the shelf next to where I write. The little known Alia Vox CD Lachrimae Caravaggio is a series of compositions and improvisations by Jordi Savall and colleagues. These are inspired by 17th century sources, but in his sleeve note Jordi Savall says "their musical language and expression are unequivocally 21st century". And the second disc of the groundbreaking The Art of the Recorder by the David Munrow Recorder Consort is devoted to 20th century music by Benjamin Britten, Paul Hindemith, Nigel Butterley and Peter Dickinson. Follow the path in David Munrow - more than early music. About Baroque played as I wrote that post. One thing occured to me. The CD is sonically stunning. But not just because it is fine music that has been well recorded. It is sonically stunning because the sound of period instruments seems to be particularly suited to the recording process. Roger Norrington's Beethoven Symphony cycle for Virgin with the London Classical Players is a case in point. I do not like the interpretations. But sonically they are winners. Perhaps that is why "period style" is percolating into later classical music genres. The notion of some instruments being more suited to the recording process is new to me. I take your meaning to be not the particular setup to record this particular CD but recording in general, and that it's the, "lighter but more textured and focussed sound", that makes the difference. Makes me wonder if the sound is just easier to replicate with current technology as well as being easier to to capture. Yet another path I hope you'll continue traveling. 'The notion of some instruments being more suited to the recording process is new to me. I take your meaning to be not the particular setup to record this particular CD but recording in general, and that it's the, "lighter but more textured and focussed sound", that makes the difference. Makes me wonder if the sound is just easier to replicate with current technology as well as being easier to to capture. Yet another path I hope you'll continue traveling'. Lyle, you are right. This is a very interesting path which links to others that have appeared here recently. Let me also say at this stage that there are dangers in discussing complex topics such as this in simplified form. But I will continue at the risk of being accused of “bad science”. Certain combinations of music and instrument reproduce better through audio systems than others. Which is why a hi-fi salesperson will play you Jacques Loussier rather than Mahler 8. In simple terms audio systems, except for the very best, like percussive sounds with simple overtones – think guitar, harp and harpsichord – and don’t like sustained sounds with complex overtones – think romantic scores, piano and voice. This is why station ident jingles, and the soundtrack of commercials favour a particular style of composition and instrumentation - until very recently radio and TV sound systems were poor quality. A very great but unknown talent, Nick Drake, was discovered by a large audience because his simple and audio system friendly writing for acoustic guitar was used in a 1999 Volkswagen TV commercial. And the same thing has happened again in 2010 with an AT & T commercial which uses his simple but beautifully crafted music. Period instruments tend towards “audio friendly” sounds – percussive and less overtones. Hence they sound impressive through home systems. This path raises all sorts of interesting questions. Have the ears and brains of the young people – the MP3 generation - lost the ability, like their audio systems, to decode more complex musical sounds? Does this explain the increasing popularity of world music, the sound of which is largely percussive and light in complex overtones? Does it also explain the decline in popularity among young listeners of classical music? Do we need to spend more time thinking about the auditory capabilities of audiences and the limitations of audio reproduction systems? Do we need to think more about the lost art of listening? Absolutely essential reading – John Crabbe’s Hi Fi in the Home. It may date from 1968 but there is no better guide about how to reach new audiences. Amazon UK currently has six used copies available – get moving. Personally, I would put the resurgence of interest in Nick Drake a few years earlier than 1999. Some time in the mid 80s, when Joe Boyd released the Fruit Tree boxed set and the compilation Heaven in a Wild Flower. TMH, you are right. There were really two phases to Nick's resurgence. Joe Boyd's continuing advocacy in the 1980s brought him to the attention of music buffs. The VW commercial in 1999 brought him to a mass audience. Interesting path your comment takes us on. Robert Kirby, who did the arrangements for Five Leaves Feft and Bryter Later started his career in baroque music. Well, I seem to have fallen into the "music buff" rather than "mass audience camp"! I am too young (sadly not a phrase I get to use very often any more)to have known Nick's music in his own lifetime. It was though the release of the Fruit Tree box set on vinyl in the 80s that I became aware of him, and he is one artist that I have returned to with great frequency for a quarter of a century now. Perhaps we can also identify a third resurgence? With artists such as Brad Mehldau and the Unthanks now covering his songs. "Sonic winners" ... How much of this would be the sound engineers's work ? Let us not forget that these works were made to be performed in smaller places and orchestrated accordingly. Mahler was a case in doing small but significant changes in the orchestration of his works according to the venues he played. I very much hope you, "will continue at the risk of being accused of “bad science”. Then if someone wants to correct you, your readers will learn even more. This sort of info seems a crucial part to the "whither classical music" issue, and is so very rarely mentioned. My guess would be a no to most of these questions. For one, there is essentially no audible difference between high quality MP3s, the bulk of what people would be listening to over the last few years, and any other format sans live performance. Young people would only stand any chance at all of being unable to decode complex overtones if they didn't listen to complex overtones on a regular basis already, which is unlikely. If you go back 10 years MP3s were noticeably lower quality but CDs were a lot more common as well. Also, I'm hard pressed to believe that world music is made up of simple overtones and classical music is made up of highly complex overtones. I haven't personally sorted through hordes of spectrograms to verify but it seems unlikely that sitars or gamelans have simpler overtones than classical instruments. The whole question is moot if classical instruments don't produce more complex partials. And gamelan's are not that common in world music, and neither coming to that are sitar's. France has the biggest global market for world music and African and Middle Eastern instruments predominate - the oud and kora for example both sound well on relatively low fi systems. Just ordered the Crabbe book - Thanks for the tip. Your back and forth with JoshMc reminds me of an idea I've long had, that when non music specialists say they can't hear the problems in a performance that specialists do, part of what they might really be saying is that they can't verbalize the specifics of the problems, but I think the impact of the performance might be lessened for them, even if they can't say exactly why. Something similar may be at play here. Following you over the years I've often thought you must have a great set of ears. Seems possible what's consciously audible to you may not be as apparent to others who haven't spent nearly the time and energy you have with recorded music. That 10,000 hours that the neuroscientists say takes a skill like making music to another level probably has an effect on listening to music as well. That link describes various audio formats but it doesn't tell us whether you can actually hear the difference. When learning about compression in school, my teacher played a CD and compared it to MP3s at various bitrates. 96bit, 128kbit, and even 192kbit files showed a noticeable difference. Then he played a 256kbit MP3, talking it up as if we'd still be able to hear the difference, and ended up with a sort of defeated look on his face when he couldn't even admit to being able to tell the difference himself. It's rare to find MP3s under 256kbit anymore and usually they're compressed at 320kbit. I've mixed my own recordings down to both of these and listening to the compressed formats sounds the same as listening to the mix before mixing it down when everything is at 96khz and 24bits. Maybe some people really feel they can hear the difference but they believe 16g wire vs 18g will make their sound system 10% better also. Test it yourself, take a really good quality CD and rip the music to MP3 at different bitrates and compare. This is all beside the fact that people are jumping on the FLAC bandwagon en masse lately. On the world music front, I browsed the world music charts on iTunes and honestly couldn't find anything that sounded like it was using particularly sinusoidal instruments. No flute or koto music or even anything that used an oud or kora unless they were hidden in an ensemble of other instruments that would make up any overtone deficit. The plainest stuff I could find, instrumentation wise, was acoustic guitar music but guitars have highly complex sounds. Now that I think of it, distorted guitars have been popular in the western world for decades and nothing has more overtones than they do save the also popular crash cymbal. I guess I just have trouble seeing how any music is made up of fewer overtones than classical music and even if one could pull a spectrogram out to prove it, the answer to the original question would still be no because there are classical pieces for timpani or djembe or flute ensembles that haven't entered popular culture in the slightest. I apologize for the anecdotal evidence and length but I feel there's a strong case to be made in the negative on these questions. 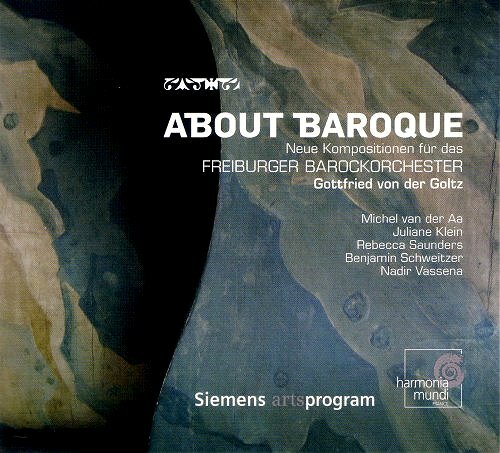 You all need to know the CD "Shock of the Old" (2002), featuring 8 contemporary works by members of the Common Sense Composers' Collective, played by American Baroque. Very wonderful synergy between post-minimalism and baroque style.